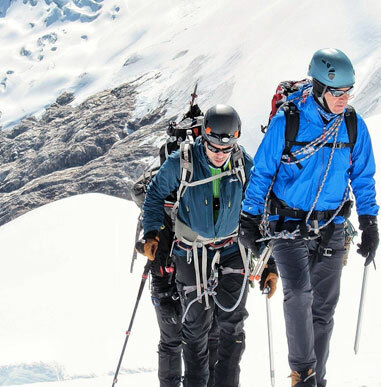 We’ll have a mandatory gear check at 10:00 a.m. at the Alpine Ascents office in Seattle. This will ensure that everyone is fully equipped and prepared to depart the next morning. Rental gear is fitted and packed at this time. Duration: Approximately 1.5 hours. The drive from the Alpine Ascents office to our meeting location the following day is approximately four hours. We’ll meet at 7:30 a.m. at the Inn of White Salmon in White Salmon, WA. Next we’ll drive to the Cold Springs trail head and begin our approach. Approximately five hours will be spent on the moderately strenuous approach, as we begin our hike from 5,600 feet in the forest. Our climb will take us through forest, high alpine meadows and seasonal snow-covered regions to High Camp, which is spectacularly situated at Lunch Counter, (9,250 feet). From this spot, climbers can view stunning Mt. Hood to the south, and the sunset to the west. On this day we cover basic snow skills, use of ice axe, self-arrest, and walking/climbing in crampons on snow. Summit day. To ensure safety and optimum traveling conditions, we’ll begin the climb early to reach the summit around dawn. Our route takes us to 12,276 feet, where we’ll reach the true summit of Mt. Adams. We’ll take photos of Mt. 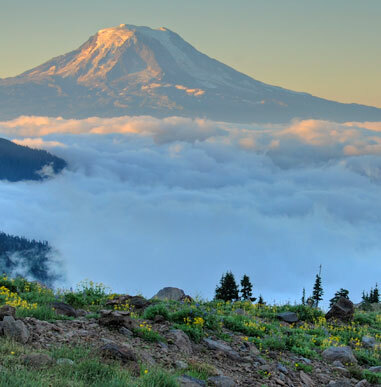 Rainer, as well as the other volcanoes visible from Adams’ summit, such as Mt. St. Helens and Mt. Hood. 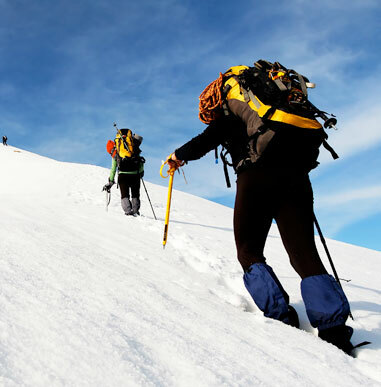 At a moderate pace, the summit climb should take four to six hours. On our way down, should conditions warrant, we’ll have the opportunity to glissade and this can be one of the most enjoyable aspects of the descent back to High Camp. At High Camp, we’ll pack up or belongings and head down to the trailhead, then either overnight in Trout Lake or drive back to Seattle.